Mausam (transl. Season) is a 2011 Indian romantic drama film written and directed by Pankaj Kapur under the Vistaar Religare Film Fund banner. The film stars Shahid Kapoor, opposite Sonam Kapoor in the lead roles. The film was originally scheduled to release on 16 September 2011, but due to the delay in obtaining the NOC from the Indian Air Force, it was pushed back further by a week, releasing on 23 September 2011. The main story of the film spans over a period 10 years, from 1992 to 2002 and includes references to Demolition of Babri Masjid, Bombay riots, 1993 Bombay bombings, Kargil War, 9/11 attacks and Post-Godhra Riots. Mausam is the story of two lovers, Harinder Singh, known as Harry (Shahid Kapoor) and Aayat (Sonam Kapoor). Harry is a happy-go-lucky Punjabi guy, whereas Aayat is a Kashmiri girl. In 1992 Aayat (Sonam Kapoor) and her Bua (Aunt) Fatima (Supriya Pathak) escape from Kashmir due to Militancy. Aayat's parents are murdered by the Militants, thus forcing her Uncle Ghulam Rasool (Kamal Chopra) and her chacha Maharaj Kishan (Anupam Kher) to send her along with her Aunt to Mallukot. In Mallukot, Aayat meets a young Happy-Go-Lucky boy named Harinder 'Harry' Singh (Shahid Kapoor). Harry is the son of a College Professor. He and his friends are popular locals who spend their days goofing around. A Mallukot girl named Rajjo (Aditi Sharma) however nurses a deep crush on Harry, but he constantly rejects her. But when Harry meets Aayat for the first time he is instantly smitten and falls in love with her. Aayat initially is hesitant but later reciprocates his love. They both grow close during the preparations of Pammo's (Harry's younger sister's) wedding. Pammo gets married to Mahinder Pal 'MP' Singh (Herry Tangri), Harry's friend from London. However following day after hearing the news of Babri Masjid's Demolition, Aayat and her family flee to Mumbai. Aayat however leaves without informing Harry, thus leaving him brokenhearted. In the meanwhile, Harry gets selected in the Indian Air Force, thus he also leaves Mallukot. In 1999, Harry and Aayat again meet in Edinburgh. Aayat has been staying in Edinburgh for the past seven years, after losing her relative in 1993 Mumbai Bomb Blasts. Harry has been sent by Indian Air Force on a special assignment. In London they again grow closer thus prompting Aayat's family to fix her marriage with Harry. Aayat later invites Harry over to her place. However just on the day of the visit, there is outbreak of hostilities between India and Pakistan in the Kargil sector, thus Harry is immediately recalled to India. On arrival, Harry is posted with a Mirage-2000 Squadron in Jodhpur. Meanwhile, Aayat's uncle passes away thus forcing her entire family to relocate from London back to Mallukot. Aayat and Harry both try to contact each other but fail. Harry is later deployed to Adampur Air Base (Gwalior Air Base in reality), where he is attached with No. 7 Squadron "Battleaxes". Aayat goes to Ahmedabad and from there returns to London. In order to dislodge the enemy from Tiger Hill, Indian Air Force resorts to heavy aerial bombardment. Harry is selected to lead a special bombing mission over Tiger Hill. The mission is successful but Harry's aircraft malfunctions, thus he crash lands. It is later revealed that Harry's left arm is semi-paralysed and he himself would require 2 months to recover. Aayat meanwhile has left London, she stays with a Family friend's son (Akram) in New York, while her Aunt has returned to Ahmedabad. Two months later Harry is in Switzerland, for his nephew's birth, here Pammo convinces Harry to not let go of Aayat. He goes in search of her and realizes that she is in New York. However while travelling in a train in Switzerland, Harry spots Aayat with Akram and his son. Mistakingly believing that Aayat is married, he Feels that all hopes are lost, and thus completely decides to forget her. Terrorists bomb New York WTC Towers on 11 September 2001. As a result of these attacks there is a sudden surge in Hate Crimes against Muslims in USA and Europe., prompting Akram and Aayat to return to Ahmedabad. Coincidentally even Harry is in Ahmedabad, for his friend's wedding. Meanwhile, Aayat decides to forget Harry and marry Akram. However, in 2002 when the wedding is about to take place, Ahmedabad is engulfed in Riots. Aayat runs for her safety and is saved by Harry, who is also hiding. Harry and Aayat wait until the rioters leave, but they are accidentally spotted and attacked. Harry and Aayat run into a blazing fair, where they rescue a Horse and a Baby girl. Aayat laments their fate, but Harry convinces her to forget the past and see the brighter future. In the epilogue it is revealed that, Harry and Aayat get married, they adopt the Baby girl and they themselves are expecting a child. In early August 2010, Nawman Malik claimed that the title Mausam is registered under his name and filed a complaint with the Association of Motion Pictures and TV Programme Producers. He was also claiming that the story of Mausam is his. Now, Mallik has moved the Mumbai High Court asking for an injunction against producer Sheetal Talwar and director Pankaj Kapur for using the title. He has demanded a compensation of Rs10 million for the title and has submitted a digital film called Mausam, which he claims he made. The film was shot primarily in Edinburgh and India while the Air Force scenes were shot at the Gwalior Air Force Base. The shooting took two years to complete, part of the delay caused by Sonam Kapoor's illness during the shoot. In September, the film was denied submission for censorship because the Air Force had objected to a 30 second long aerial action sequence with Shahid Kapoor who plays an Air Force pilot in Mausam. Special permission had been sought and granted to shoot in a real airbase. The Air Force were objecting to a dramatic action fight sequence with Shahid on board a Mirage fighter plane. Mausam producer Sheetal Talwar announced: "We had the script cleared by the Air Force on August 23, 2010. Now suddenly they're objecting to a sequence after it's been shot, edited and the film was ready for censoring?" 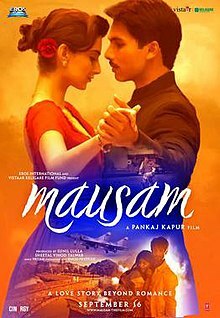 Zee News bureau gave the film 4 stars saying "‘Mausam’ can be best described as a wonderful blend of offbeat and mainstream cinema which is full of charm, elegance and vivacity." Bollycurry gave the film 4 stars out of 5 praising Pankaj Kapur's direction and saying "In his directorial debut, he tells an old-fashioned story of love, separation and reunion with flourishes and flashes of great cinema igniting what would in lesser hands, appear to be a trite tale of love gone frightfully cliched." Nikhat Kazmi of Times Of India rated it three out of five saying "The film tries to strike a balance between art and mainstream cinema and succeeds partially." Saibal Chatterjee of NDTV gave it 3 stars out of 5. Taran Adarsh of Bollywood Hungama gave the film 4 stars out of 5, saying that, "On the whole, Mausam is a slow movie!" but praises the Shahid Kapoor's performance saying "Shahid gives his all to this role, submitting himself to his director-father to mould him the way he chooses to. It won't be erroneous to state that Shahid surpasses all his previous performances, including the one in Kaminey, with this film. The film also marks the coming of age of this actor. "Rajeev Masand of CNN-IBN, was also not kind to Mausam. He rated it 2 out of 5, saying, "Director Pankaj Kapur infuses his story and his characters with a delicate, old-fashioned charm that is pleasing and quaint at first, but gets progressively exhausting when logic goes out of the window"
The film made with the budget of 38 crores, opened good at the box office but collections fell on after a week at release of force and the film grossed Rs.316 million in India. It collected ₹45 crore (US$6.3 million) gross in its first week and ended its lifetime collections with ₹74 crore (US$10 million) gross worldwide.. The film was declared a flop at box office. The music of the film is composed by Pritam while the lyrics are penned by Irshad Kamil. There are two other songs which was seen itself in the movie but it was not released. One of them is sung by Sonu Nigam and Shreya Ghoshal and is a romantic track by Pritam "Zara Si Mehdi"; the other is sung by Shreya Ghoshal, a romantic track "Abhi Na Jao Chhod Kar", adapted from an old Hindi film. Joginder Tuteja from Bollywood Hungama gave it 4 out of 5 stars and said: "Mausam is a fantastic album and has all the ingredients that make for a popular soundtrack. While 'Sajh Dhaj Ke' and 'Mallo Malli' are the pick of the lot when it comes to instant chartbusters in the making, 'Rabba Main Toh Mar Gaya Oye' and 'Ik Tu Hi Tu Hi' are good enough to enjoy a rather extended shelf life. Just pick this one up!" Upcoming Male Vocalist of The Year Shahid Mallya - "Rabba Main Toh Mar Gaya Oye"
Song representing Sufi tradition "Rabba Main Toh Mar Gaya Oye"
^ "Shahid to act with dad Pankaj Kapoor". The Times of India. 8 February 2010. ^ Kamal Jain (26 September 2011). "Eros International eyes 30% growth this year on new films". ^ IANS. "'Mausam' Box office Collection/Earning : It crossed 69 Crores". ^ "Pankaj Kapur's Mausam in legal trouble". Bollywood Hungama. Retrieved 13 September 2010. ^ "IMDB page". Retrieved 29 February 2012. ^ "10 Facts about Mausam that you didn't know". Retrieved 29 February 2012. ^ "Mausam denied clearance by Air Force". Bollywood Hungama. Retrieved 13 September 2010. ^ "Review: Shahid-Sonam starrer 'Mausam' is poetry in motion!". Zee News. ^ "Shahid Kapoor stands tall in 'Mausam' (Review – Rating: ****)". ^ Kazmi, Nikhat (22 September 2011). "Mausam – The Times of India". The Times of India. ^ Saibal Chatterjeee (23 September 2011). "Mausam Review". NDTV.com. Archived from the original on 7 January 2012. ^ Rajeev Masand (23 September 2011). "Mausam Review". CNN-IBN. ^ http://www.moneycontrol.com/stocks/stock_market/corp_notices.php?autono=480722 Official press release pdf tagline goes "Eros International announces opening weekend collection of Rs.190 million gross for Pankaj Kapoor's Mausam"
^ "Mausam: Music Review". Bollywood Hungama. Retrieved 16 August 2010.